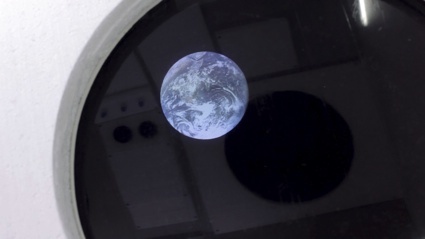 A view of Earth as seen by the receding astronaut on his one way journey (Credits: J. Popper). Artist Joseph Popper whose exhibit One Way Ticket is featured at this year’s Design Interactions Show in the United Kingdom, was intrigued by the idea of explorers running out of places to explore. He asked himself what would it be like to have a last frontier extreme adventure: a single astronaut to take a one way trip into deep space with no prospect of return. Popper approached the project with an eye on technical accuracy. In his vision, a single person could pack enough supplies to survive for two years, becoming the first person to reach lower Mars orbit before travelling on as far as possible via a series of Hohmann transfers – likely about 90 million miles from Earth.